Peter Weatherson scored an important and superb hat trick to secure the points for Annan in a match which now creates a gap between Annan and the bottom teams and leaves East Stirlingshire battling in the lower reaches of the league. For long spells it was a battle for Annan who had to work hard against a determined Shire team who were reduced to ten men after David Bates was sent off in the 50th minute for a reckless challenge on David Hopkirk. 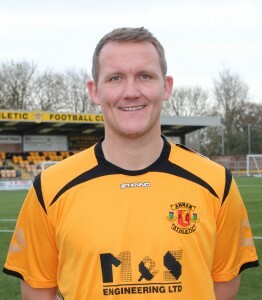 Annan boss Jim Chapman made one change in the starting eleven who were defeated against Elgin with Steven Swinglehurst making a welcome return after injury to the centre of the Annan defence with recent signings Calum Cook and Chris Dickinson getting a place on the bench along with a couple of trialists. The Shire piled on the early pressure and in the opening minutes forced a corner with Mitchell pulling off an important stop low down to deny David Greenhill and in the 5th minute Mitchell was called into action again to deny David McKenna. Annan survived the early pressure and in the 8th minute on their first real attack on the Shire goal they struck gold. Weatherson started the move off heading the ball wide to Hopkirk who eluded a challenge to clip the ball into the heart of the Shire defence who only half cleared the ball as far as Weatherson who slotted the ball low and hard into the corner of the net past keeper Ritchie Barnard from 10 yards . Annan built on this early success when Stuart McColm was sent clear down the left finishing with an inviting cross aimed for Hopkirk but the ball was scrambled cleared for a corner kick. After 15th minutes Flynn won a free kick 22yards out and Weatherson’s well placed free kick went narrowly over the bar. At the other end Lloyd Kinnaird was presented with a similar opportunity but the free kick went past the post. The Shire then created a promising move after 33 minutes when David McKenna connected with a cross from the No 11 trialist to force a corner but a minute later the home team were back on level terms. Annan got stretched down the left after some neat football cut open the Annan defence and ball played in found David McKenna on the edge of the box with acres of space and he finished clinically with a low shot well beyond the reach of keeper Alex Mitchell. Annan finished the half strongly, Weatherson came close when his free kick in the 37th minute hit the side netting, Hopkirk’s 40th minute shot pulled off an instinctive save from Barnard and from the corner Flynn blasted over the bar. East Stirlingshire started the second half like the first on the attack and they came close when trialist No11 sent in a dangerous shot which flashed across the face of the goal. Then came the sending off and from the resulting Ryan McStay free kick Barnard tipped Weatherson’s header past the post for a corner. At the other end Neil McCabe’s shot was deflected safely into the arms of Mitchell. Alex Mitchell pulled off an important save tipping McCabes 62nd minute net bound shot over the bar and from the resulting corner Annan had to defend in numbers to keep their goal in tact and almost immediately at the other end Annan were on the attack forcing a corner . With 69 minutes gone Annan were gradually looking more in control and Josh Todd was denied when Barnard pushed his effort for a corner kick. Annan finally made the breakthrough in the 75th minute with a superbly worked goal, the play leading up to the goal involved numerous passes before Hopkirk once again was the provider picking out Peter Weatherson with an inviting cross and Weatherson did what he has done all season guiding the ball into the net with his head from 5 yards. The goal was just reward for Annan who had gradually taken control of the game. As the match entered the final 10 minutes Annan looked comfortable but they had a scare in the 86th minute when Kieran Brannan cleared the trialists effort from the goal line following a corner kick. Annan killed off any chance that East Stirlingshire had in the 87th minute with another well worked goal after Hopkrik again finished a good move off down the right with an inviting cross which Weatherson once again finished clinically when he headed into the net to complete an excellent afternoons work to keep their hopes of a play off place still within their grasp and with Berwick conceding an injury time goal to Montrose the scene is all set for Annan and Berwick to battle it out next week at Galabank. EAST STIRLINGSHIRE. Ritchie Barnard, Connor Greene, Lloyd Kinnaird, David Bates, Chris Townsley, Ross Gilmour (Trialist 54 min), Graeme McGregor, Neil McCabe, David Greenhill, David McKenna, Trialist (Billy Vidler 69 min). Substitutes not used Sean Quinn GK, Steven Brisbane, Paul Brennan, Martyn Shields, Michael Bolochoweckyj. ANNAN ATHLETIC: Alex Mitchell, Kieran Brannan, Steven Swinglehurst, Martin McNiff, Peter Watson, Ryan McStay , Josh Todd , Matthew Flynn, Peter Weatherson, David Hopkirk, Stuart McColm (Trialist 69min) Subs not used Calum Cook, Chris Dickinson, Steven Logan, Omar Rabine,Trialist, Jordan Hart GK .